The king suite was very spacious and comfortable. Probably due to remodeling, bathroom did not contain any towel hooks or bars for hanging. Also ran out of toilet paper with no extra rolls stocked in room- had to go to front desk in early morning hours to obtain. Where to find Romeoville hotels near an airport? 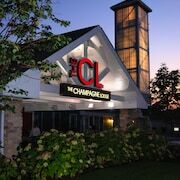 Where can I find hotels in Romeoville that are near tourist attractions? 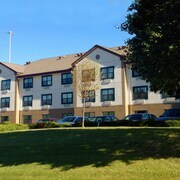 Romeoville has a wide selection of quality lodging options to choose from. Spend some time perusing our 20 hotel listings, all of which can be found within a 0.1-kilometre (0.06-mile) radius of downtown Romeoville. 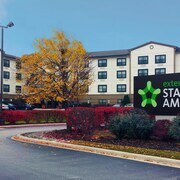 If you are after accommodation that is within a stroll from the Romeoville city center, Country Inn Suites Romeoville and Extended Stay America Chicago - Romeoville will be perfect. Expedia's hotel database has only a small selection of budget accommodation options in Romeoville. The Super 8 Romeoville Bolingbrook is one of them. The The Hyatt Lodge at McDonald's Campus is 25 kilometres (16 miles) from the main part of Romeoville. 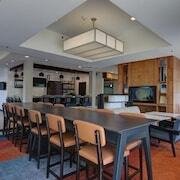 Another option is the The Westin Lombard Yorktown Center, which is located 25 kilometres (15 miles) away. Some other Expedia-listed accommodation options include the Hotel Arista at CityGate Centre and the Springhill Suites by Marriott Chicago/Burr Ridge. Looking for things to do? Why not spend the day enjoying Woodfield Mall and Legoland Discovery Center, which you'll find in Schaumburg, 45 kilometres (28 miles) to the north of Romeoville. Expedia-listed Schaumburg hotels and accommodations are the Renaissance Schaumburg Convention Center Hotel and Residence Inn by Marriott Chicago Schaumburg/Woodfield Mall. Alternatively, you could consider staying at Algonquin, 60 kilometres (38 miles) to the north of Romeoville, where you can choose from the Holiday Inn Express Hotel & Suites Chicago-Algonquin and Victorian Rose Garden. The Terrace Hill Golf Course and Raging Buffalo Snowboard Ski Park are just some of the more popular points of interest to check out for those visiting Algonquin. Before your Romeoville trip draws to a close, why not spend an afternoon cheering along with local sports obsessives at a local game. Wrigley Field is 50 kilometres (32 miles) to the northeast of Romeoville. Those wishing to find a bed near to the action can take their choice from the Roscoe Village Guesthouse or the Best Western Plus Hawthorne Terrace Hotel. Our destination page is a great way to discover more about Romeoville. What are the most popular Romeoville hotels? Are there hotels in other cities near Romeoville? 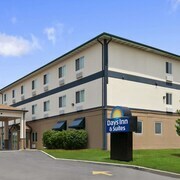 What other types of accommodations are available in Romeoville? Explore Romeoville with Expedia.ca’s Travel Guides to find the best flights, cars, holiday packages and more!